A straight line triangle representation (SLTR) of a planar graph is a straight line drawing such that all the faces including the outer face have triangular shape. Such a drawing can be viewed as a tiling of a triangle using triangles with the input graph as skeletal structure. 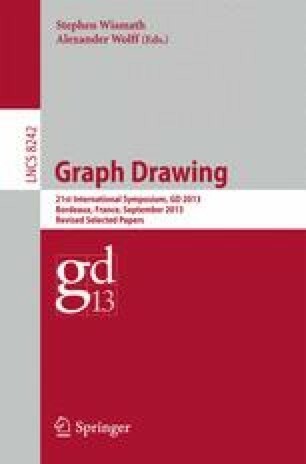 In this paper we present a characterization of graphs that have an SLTR that is based on flat angle assignments, i.e., selections of angles of the graph that have size π in the representation. We also provide a second characterization in terms of contact systems of pseudosegments. With the aid of discrete harmonic functions we show that contact systems of pseudosegments that respect certain conditions are stretchable. The stretching procedure is then used to get straight line triangle representations. Since the discrete harmonic function approach is quite flexible it allows further applications, we mention some of them. The drawback of the characterization of SLTRs is that we are not able to effectively check whether a given graph admits a flat angle assignment that fulfills the conditions. Hence it is still open to decide whether the recognition of graphs that admit straight line triangle representation is polynomially tractable.